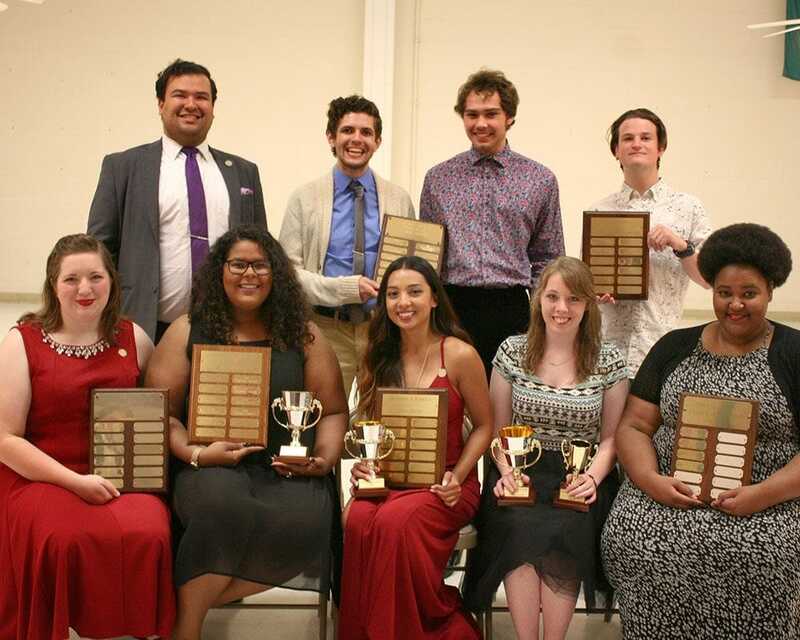 Thirteen William Carey University theatre students were honored at the 2016 Theatre Awards Dinner. This annual event recognizes the contributions and talents of theatre majors and students of other majors who participate in theatre throughout the academic year. Deshawn Weston of Desoto, Texas, was awarded the Obra L. Quave Scholarship. This fund was established in 2001 on the occasion of “Echoes for Excellence,” a tribute to Quave and his years of service to WCU. Nadia Trinanes of Hattiesburg was named Most Valuable Player. This is the theatre’s most prestigious award and is voted on by the students. She also received an Acting Achievement Award, a Technical Excellence Award, and the Shannon T. Robert Theatre Scholarship. This scholarship was established in 2007 by WCU alumnus John Clearman in honor of Robert’s exemplary service to WCU and its students as a member of the theatre department faculty. Additional Acting Achievement Awards were presented to Branden Lindsay of Simpsonville, South Carolina; Liberty Sites of Crestview, Florida; and Damien Williams of Chunchula, Alabama. Acting Awards are voted on by a secret panel of persons outside the theatre who have attended every major production by WCU Theatre throughout the year. Lindsay also received the O. L. Quave Theatre Scholarship. This fund was established in 2001 on the occasion of “Echoes for Excellence,” a tribute to Quave and his years of service to WCU. Williams received the Mark Wilkinson Scholarship. Friends of the late Mark Wilkinson, a theatre graduate of WCU, established this annual scholarship for a theatre major. Taylor Abbott and Nicoli Hutchison, both of Picayune received the Bob Crumpton Memorial Scholarship. This scholarship was established by Allison Chestnut in memory of a civic and denominational leader of Pensacola, Florida, and is given to a theatre major. Treya Brown of Hattiesburg received the Obra Quave Legacy of Learning Scholarship. This scholarship honors faculty of Carey for their years of service with a Learning Legacy Dinner. Proceeds from the dinner fund the scholarship. Johonna Bush of Foxworth was awarded the Norma Sullivan Memorial Scholarship, named in honor of the 1921 Mississippi Women’s College graduate and faithful patron of Carey music and theatre. Amanda Campbell of Picayune received the Joyce Quave Roberts Memorial Scholarship, which honors the memory of the sister of professor emeritus Obra L. Quave who served as chair of the theatre and communication department for more than 40 years. She also received a Technical Excellence Award. Devon Griggs of Picayune received the R. E. Cromis Memorial Scholarship which is awarded to a theatre major in memory of the husband of Mrs. Wilda Cromis of Pontiac, Mich.
Ben Salters of Ocean Springs received the William Shakespeare Award. This award is given by Dr. Allison Chestnut to a theatre major in recognition of their scholarship in theatre and to honor the English playwright. Victoria Wetter of Forsyth, Missouri, received the Theatre Service and Appreciation Award. This new award is given to a theatre major who goes above and beyond in service to the theatre program.